Beyoncé, Foxy Brown, Jaz-O, Justin Timberlake, Kanye West, Linkin Park, Memphis Bleek, R. Kelly, Swizz Beatz, The Notorious B.I.G. I Shawn Corey Carter (mibait Diciembre 4, 1969), a mas kilala king kayang talipampan a Jay-Z (a neng kayi misusulat a JAY Z), metung yang rapper, record producer, ampong negosyanti. Metung ya kareng pekamatagumpeng hip-hop artist ampong negosyanti king pisalapyan king America. 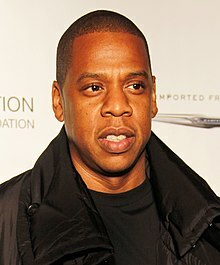 Anyang 2012, tinantya ne ning Forbes ing pibandyan nang Carter a alus $500 million. Mekapisali neng manga 50 milyung album king mabilug a yatu, at tinanggap 17 Grammy Award para king kayang obra king musika, bukud kareng dakal a nominasyun. E mamako king listaan da reng pekamapyang rapper king king kabilugan ning panaun, at tinuring ne ning MTVng mumuna king karelang listaan a The Greatest MCs of All-Time anyang 2006. Mituring lang kayabe deng atlu kareng kayang album, Reasonable Doubt (1996), The Blueprint (2001), ampong The Black Album (2003), kareng makabaldugan dili king uri ning musikang iti, at mibili la king listaan ning Rolling StoneTemplate:' a 500 greatest albums of all time. Empire State of Mind: How Jay-Z Went from Street Corner to Corner Office by Zack O'Malley Greenburg (2011: Portfolio (Penguin), 240 pages) ISBN 978-1-59184-381-8. An unauthorized biography detailing Jay-Z's life from his beginnings in Brooklyn as told by his friends and former colleagues. ↑ Jay Z officially drops the hyphen from his name. NME.com. IPC Media Entertainment Network. Retrieved on 2013-07-18. ↑ Krishnamurthy, Sowmya. MTV: Jay-Z Officially Drops Hyphen To Become Jay Z. MTV. Viacom International Inc. Retrieved on 2013-07-18. ↑ Michaels, Sean (19 July 2013). "Jay-Z to become Jay Z in massively disrespectful move against hyphens", The Guardian. Retrieved on 2013-07-19. ↑ "Hip Hip's Wealthiest Artists", Forbes. Retrieved on May 4, 2012. ↑ Sherwin, Adam (June 26, 2008). "Blingedup wellies for Glastonbury arrive at JayZs hotel", The Times. ↑ RIAA – Gold & Platinum – August 8, 2008. Riaa.com. Retrieved on September 4, 2010. ↑ Grammy Awards: Fun., Black Keys, Jay-Z win big. Newyork.newsday.com (February 11, 2013). Archived from the original on April 11, 2013. Retrieved on February 11, 2013. ↑ MTV ranks Jay-Z the greatest MC of all-time. MTV. Retrieved on July 28, 2012. ↑ Rolling Stone ranks Reasonable Doubt #250 on its list of the 500 greatest albums of all time. Rolling Stone. Retrieved on July 28, 2012. ↑ Rolling Stone ranks The Blueprint #252 on its list of the 500 greatest albums of all time. Rolling Stone. Retrieved on July 28, 2012. ↑ Rolling Stone ranks The Black Album #349 on its list of the 500 greatest albums of all time. Rolling Stone. Retrieved on August 26, 2013. ↑ "Jay-Z 'Decoded'", Fresh Air interview transcript, November 16, 2010. Retrieved November 16, 2010. ↑ "About the Book|JAY-Z Book: Empire State of Mind"
Tauli yang miyalilan ining bulung anyang 14:31, 22 Agostu 2014.